Polka Dot Overload | Sewing, knitting & vintage projects, tips, tutorials and cartoons! 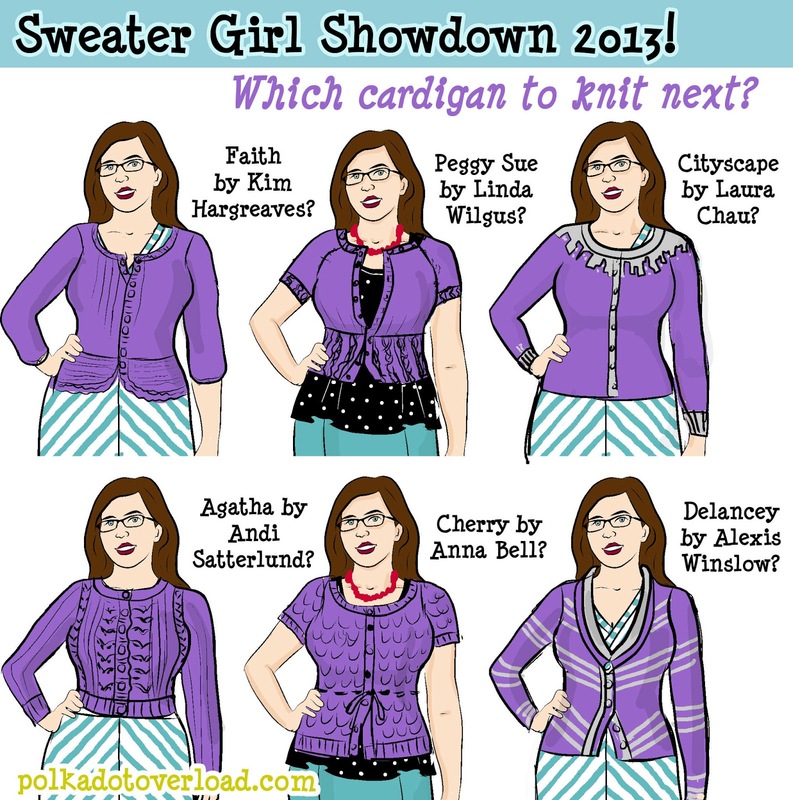 : Sweater Girl Showdown 2013: Which snug little cardigan to knit next? 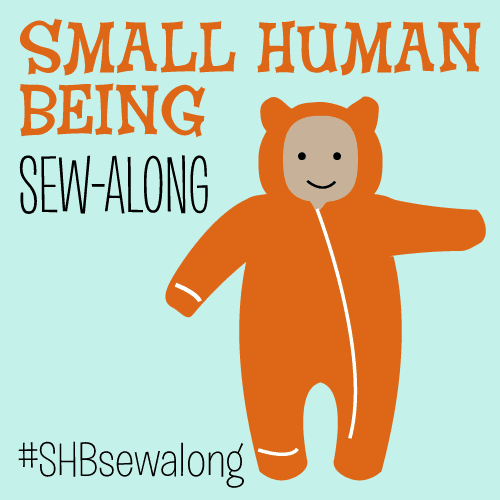 Sweater Girl Showdown 2013: Which snug little cardigan to knit next? Cardigan indecision overload! Please. Help. Me. As a knit-loving girl approaches the end of her second TARDIS sock, her thoughts naturally turn to... sweaters! Said girl will not dwell on the length of her Ravelry queue (though it might be said that even the most productive of knitters might take several lifetimes to complete it) but will instead look ahead to her very next project—another cardigan. So... last time around I chose the Georgina in chartreuse. 1. Faith peplum cardigan by Kim Hargreaves from Heartfelt: The Dark House Collection. Pros: Peplum! Cool stitch pattern details! A lovely curve-hugging shape! Cons: No instant gratification of a quick online purchase... would have to order this book used and wait for it to arrive. GASP. CANNOT DEAL. Not sure about the not-slim sleeves, either. 2. Peggy Sue Cardigan by Linda Wilgus from her website Wooly Mammoth Knits. Cons: I'm not sure if it would look too prim on me when buttoned up. And I passed it over last time—there must have been a reason why? 3. Cityscape Cardigan by Laura Chau from Twist Collective. Pros: Little colorwork buildings marching around my neck! Cons: Eternal plain stockinette boredom knitting hell once the neck fun is all over. 4. Agatha by Andi Satterlund of Untangling Knots. Pros: If Lladybird has knit MORE than one of these, it's got to be an AMAZINGLY fun sweater to knit, am I right? Lots of cool details and shaping and lacy fun. Cons: It might emphasize how short-waisted I am? 5. Cherry by Anna Ball. Pros: Sweet little vintage-esque cardigan with a cute stitch pattern and defined waist, almost peplum-esque but not quite. Cons: Does it actually make any sense to knit a short-sleeved wool cardigan? (pattern suggests cotton, but I do NOT knit cotton after several bad experiences with baggy saggy sweaters of stretched-out misery). 5. Delancey Cardigan (shortened version) by Alexis Winslow from her website Knit Darling. Pros: Um, hello. STRIPES. CHEVRONED STRIPES. Plus, plunging neckline. Plus, full with color patterning. Cons: Same (amazing) designer as Georgina. Not branching out and trying new pattern designers. I was super super indecisive when I drew all this up... but now that I look at it, I'm dithering between just two, with a strong inclination towards one of them... can you guess? Which cardigan would YOU knit if you were me? They are amazing, aren't they? I think I will go Delancey for now but I hate having to decide... I wish I weren't such a slow knitter. I think the Agatha will love wonderful on you. Aw, thank you! I do agree but realized after writing this up it is a worsted cardigan and I don't want to mess with the conversion... so maybe NEXT round! We'll see how fast I can knit. I think you've hit on it! Since my last cardigan was a shorter one that worked well with dresses, I think I'll go for the longer one this time for jeans! My money's on you deciding between Agatha and Delancey, coming down on the side of the latter. It was between Cherry and Delancey... and yes, I'm totally leaning Delancey! As much as I love Agatha I forgot to mention that Agatha is a worsted weight cardigan, so I'd have to either calculate how to convert to DK weight or buy new yarn. I am going to vote for the Delancey. I made the Agatha last year and decided it made me look short waisted too. As I have a ball left I am contemplating lengthening it because I do love the lace and overall look of it. You need to knit that Agatha! If not now, then eventually. I think it would look AWESOME on you, and it's such a fun knit aaaand we can be sweater twins (omg maybe even in our matching Tiramisus, c'mon dooo it haha). My vote is on Delancy - what a gorgeous sweater! And it looks like it would be fun to knit, so maybe I'll lurk on that after I finish my current project. Which, btw, is Peggy Sue... in that same shade of Eggplant purple. Haha! I know, we should TOTALLY be sweater twins. Maybe Agatha next... once I've busted that eggplant yarn out of my stash and can justify more yarn purchasing. 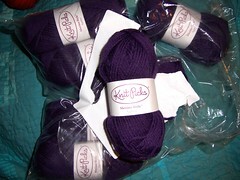 Though now you are tempting me to knit Peggy Sue in my eggplant yarn to be super sweater twins. I really like the body of the Faith, maybe you could just sub your favorite sleeves? definitely the stripes. i saw it on you immediately, just from your illustration! OMG CITYSCAPE. It's so so stunning, I have never seen anything like it. Perhaps after Delancey? you could knit little TARDIS's into it. Wow, see I would pick either the Cherry or Peggy Sue, especially with the mercury rising. Although, I do like the Delancey. But it doesn't really feel as sweater girl-ish to me as the others. Can't wait to see your socks! OMG, you have me doubting myself now... that IS a good point... BUT are wool sweaters workable in spring/summer anyway? AHHH... I'm having an identity crisis! Faith or Agatha - they seem the most flexible weather- and style-wise. I have knit Cherry, with 3/4 sleeves, and I loved it... until I accidentally felted it. But it had such a great sweater-girl vibe and it was a quick knit! I agree with you about the sleeves, but it was very easy to make them longer. i guess you're leaning towards delancey and agatha. Hmmm, I love the cityscape, but I also love the chevron stripes of your choice of Delancey. What colors are you going with?? Also, thank you SO much for posting the links to the e-books of A Stitch in Time. I dithered on purchasing them a while back and now can't find them anywhere. I had no idea they were available for e-book purchase, so that just made my day!